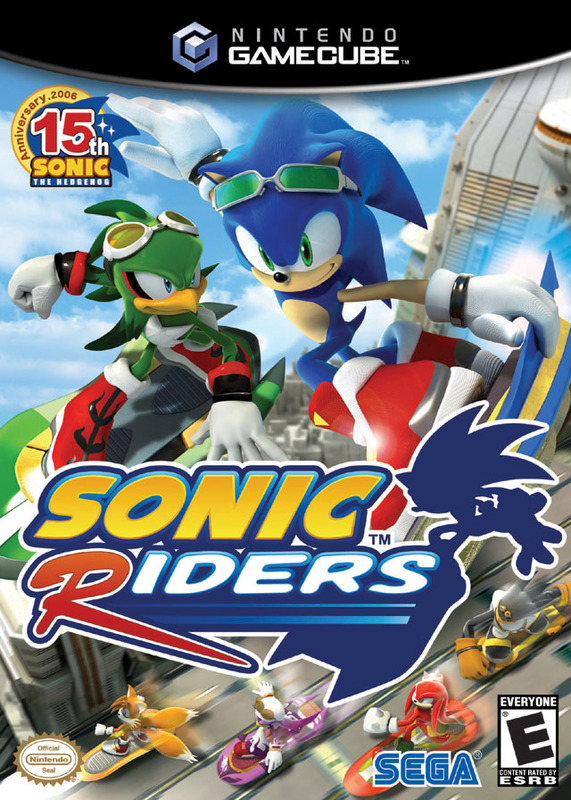 Sonic Riders teams up Sonic the Hedgehog, Tails, Knuckles and a group of new characters, in a wild new racing game. Dr. Eggman has challenged Sonic and friends to race in his World Grand Prix, and you can enter the event and try to unravel his mysterious plot. The races happen on floating boards and include tricks, fighting, and racing. You can customize your character with upgraded equipment as you race down 13 different tracks through a handful of game modes. What would you call a Sonic that would best serve as a spiritual successor to Sonic R? It would be this game. 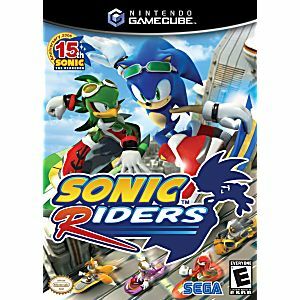 A racing game like Sonic R, but that it has cutscenes to tell a story and the game being relatively short for its generation. Sonic R for fifth generation and this game for sixth generation, both being late in the respective generations. The story revolves around Team Sonic and a team of thieves who use devices (called Extreme Gear) called Team Babylon competing in a World Grand Prix hosted by Dr. Eggman (like Sonic R). As the events go on the audience learns more about this group and why Dr. Eggman is hosting the events. The gameplay revolves around racing other opponents on said equipment, and winning said races to proceed through the stories. There are two stories that focus on Team Sonic and Team Babylon. The best means to play the game is balancing pushing the gameplay to go as fast as you can, while constantly accumulating air (the fuel of the gear) from tricks and other actions. To go extra high on ramps that go up, hold down on the gray GameCube control stick for extra height. And to go extra far on ramps that jump huge distances, hold forward. There are also mini ramps on the courses, where while the jumps aren't as high as far as the previously mentioned ramps, it's still a good idea to hold forward or backward depending on how the ramps are positioned. The game also has a few other modes, such as time attack and mission mode. Mission mode in particular (where it seems to imply to take place after the main story) centers around doing missions that revolve around more or less messing with Team Babylon. Your able to do because a list was dropped (I'm not saying who dropped it) and Sonic and his friends are then able to intercept everything Team Babylon is doing within the mode. It is especially apparent when getting gold on each mission, so try your best for some interesting reactions. However, all of the reactions (and mission mode) are (is) text-based. It's a nice touch for it to incorporate inconvenienced reactions for Team Babylon, especially considering how some were acting in the story of this game. I'm looking at you, Wave. But overall it makes sense considering the time this game was made as to why it's rather short, but the game is nice overall. It's not overly grand, but it's a nice little game, especially if this is the kind of game that interests you. Ready to go for a ride? The lands await your devices. They await your speed. Kudos to you guys for sending the disc in good quality. I dunno what the white substance on the artwork side of the disc is, but it doesn't seem to cause any problems. This game is just as fun as I remember it being as a kid. Tough learning curve, but it really does get better once you learn the mechanics. Highly recommend. Oh My Gosh! I hava a Game Cube and I am so happy I found this site!!! The games (bought more than this one!) are in excellent shape; customer service is amazing! They answer e-mail questions about any product really fast; ordering is easy; shipping is very very fast! I would highly recommend this site!